on tour vegan style with silver snakes: more seattle! hey guys! as you probably know, we’re following the band silver snakes around on tour, via vegan food text updates from band member alex. he’s taken us around—from other parts of california, to nevada, to idaho, and now they’re in seattle (still) for more tastiness. today was epic, just see alex’s updates below. oh, and don’t forget to check out silver snakes when they’re in a city near you. 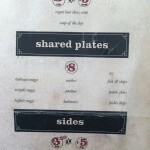 go to their show and talk them into eating with you…it may end up on this blog! 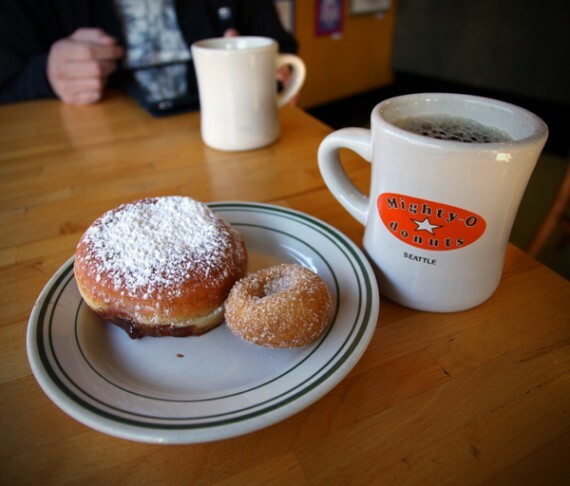 Mighty-o donuts. Seattle, WA. Naked cake and pumpkin spice donuts and a hot cocoa. Naked cake donuts are my favorite! I wish I could find them back in LA. what’s it like to be a vegan musician on tour? just ask alex estrada from silver snakes. while the band is on the road, he’s texting us updates of their vegan meals, and today they were in seattle! check it out his updates below, and go see the band when they’re in a city near you. tomorrow they’ll be at the 2 bit saloon in seattle, and i expect to see all you local readers at the CD release show on 10/23 at amplyfi! Wayward cafe. Seattle, WA. 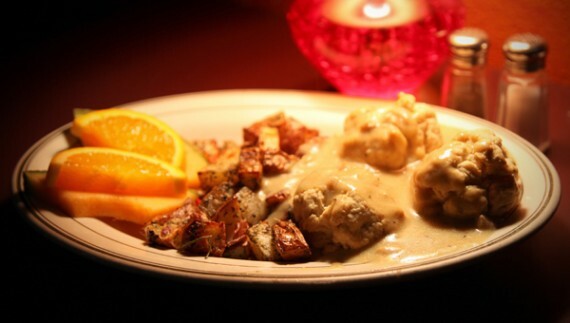 The special of the day – chicken and biscuits with gravy and a broccoli slaw. The chicken was made out of tofu that was definitely frozen and thawed. The texture was amazing! We love this place. 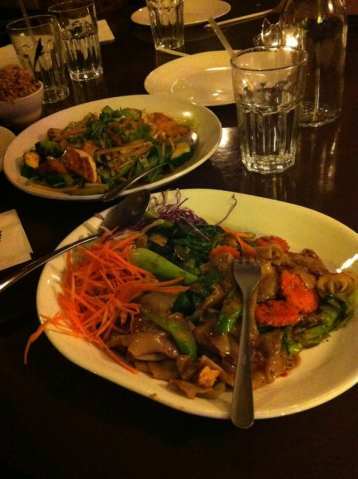 Tofu tod gatiam and phad see-iew from arayas vegetarian in seattle, WA. Tomorrow is our last day in seattle so it’ll be pretty epic! Playing tomorrow night at the two bit saloon. That thai food was amazing. Best pad see eu I’ve ever had. aw that all looks so good. i wanna go to seattle. after landing at seatac at around 9:30am on a saturday, we headed straight to georgetown to open them up for brunch. i was excited to hear that their biscuits and gravy were vegan, because we all know that i’m a huge fan of the old b&g. the skits n gravy, as the menu called them, were damn good. for 8 bucks i got a plate stacked with 3 biscuits and loads of herb roasted breakfast potatoes smothered in white country gravy with a fruit garnish. the biscuits were a tad hard for my liking, but i couldn’t fault the gravy—it was excellent. surprisingly, my favorite thing on the plate was the breakfast potatoes; they were deliciously seasoned with the perfect amount of oil. it being the start of my vacation and all, i also ordered a brunch cocktail—the clockwork orange. georgetown pours their drinks pretty strong, and after this $8 mix of vodka and oranges, i was sufficiently liquored up. 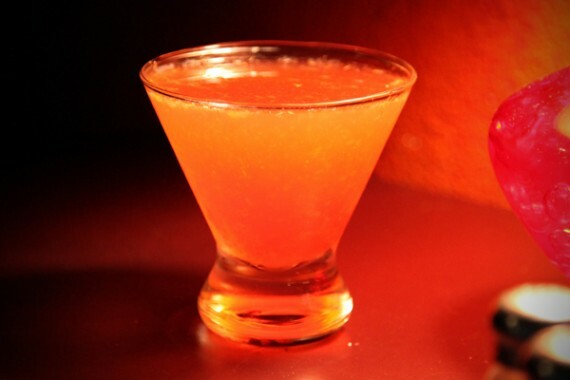 the cocktail was tasty as well, lots of pulpy fruit and the perfect blend of alcohol. i highly recommend it. although the skits n gravy were great, the other brunch entree we ordered was WAY BETTER. 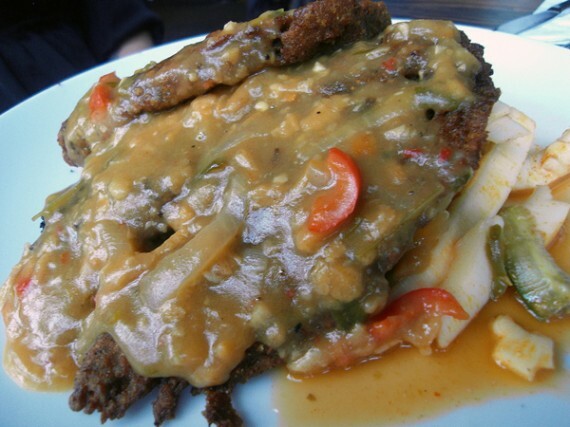 i’m talking about the chicken fried steak! 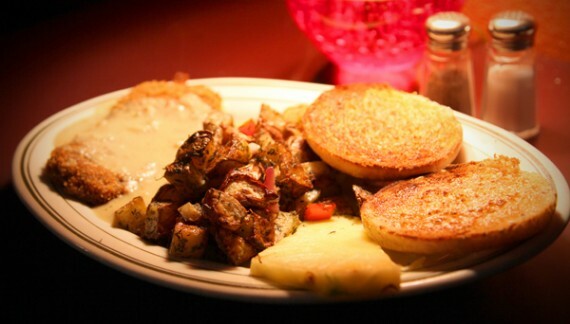 it came with the same awesome breakfast potatoes and gravy as well as a huge hunk of breaded and fried seitan. there aren’t many things better in this world then a fat chunk of vegan fried wheat meat drenched in creamy gravy, lemme tell you! this was actually my husband’s meal, but i ended up stealing tons of it and wishing i had ordered it myself. our next trip to georgetown was on our way out of seattle, right before we headed back to the airport. this time it was a week day at around 2pm, so it was time for lunch and beer rather than brunch and cocktails. we got two sandwiches to share, both of which were phenomenal. 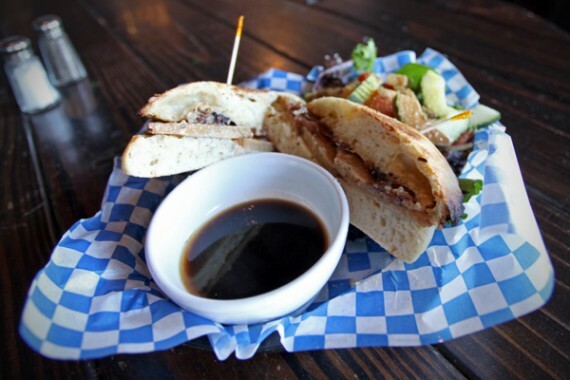 we started with a vegan version of the picard, which came with lentil-sage field roast, roasted onions, tofu cream cheese and garlic spread on a toasted ciabatta and swerved with au jus for dipping. it was insane! the bread was warm and crunchy, the field roast was hearty, and the cream cheese/garlic combo was smooth and tangy. this has really got to be one of the best vegan sandwiches known to man. 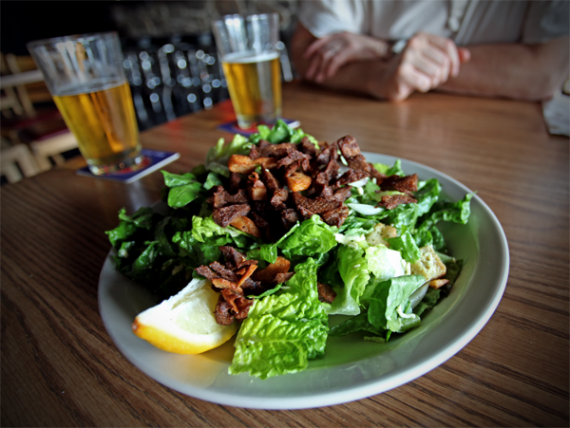 it was served with a choice of side, and we opted for the house salad which was very fresh and healthy tasting. no complaints! 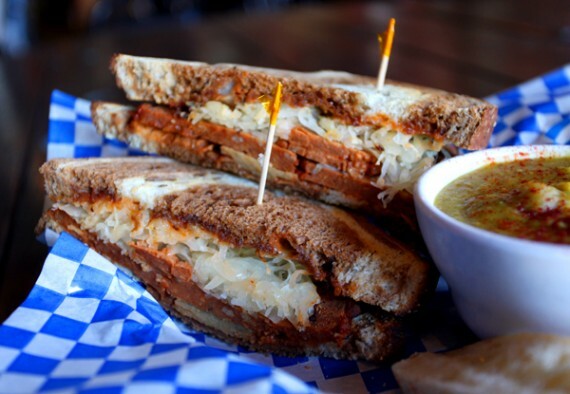 we also split a vegan version of the “darth reuben” because if i see a vegan reuben on a menu, i pretty much have to order it. 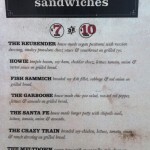 this sandwich was amazing and i can’t fault it, but it just wasn’t as special as the picard. it came with roasted tomato field roast and sauerkraut on toasted marbled rye. field roast is probably the best vegan meat substitute out there, so it worked really well as pastrami in the reuben. for this sandwich, we got the soup of the day as our side, which turned out to be split pea. 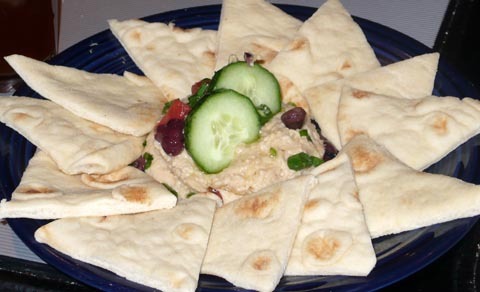 it was fantastic—very comforting and satisfying, plus it worked great as a dip for the sandwich! overall, georgetown liquor company gets an A+. it’s an all vegetarian establishment, a great little bar, and it’s got delicious vegan options for brunch, lunch, and dinner. with GLC being located so conveniently between downtown and the airport, i don’t see why i wouldn’t hit it up AT LEAST twice on every trip to seattle. 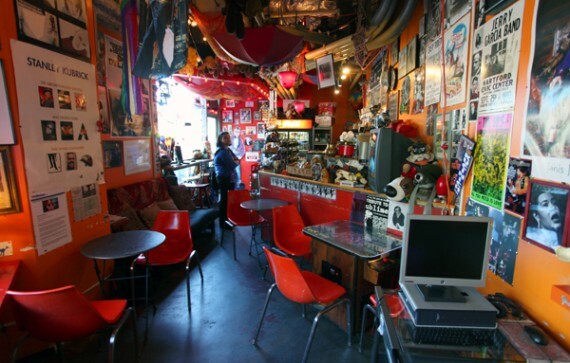 chaco canyon cafe is a sweet little restaurant in seattle that’s 95% organic, and almost entirely vegan (they offer dairy milk for coffee). 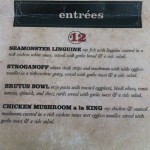 the menu is huge–they’ve got soups, salads, sandwiches, bowls, raw entrees, breakfast items, and even desserts. we popped in for lunch on our recent vacation to the pacific northwest, and were impressed with the cafe’s charm and delicious food. 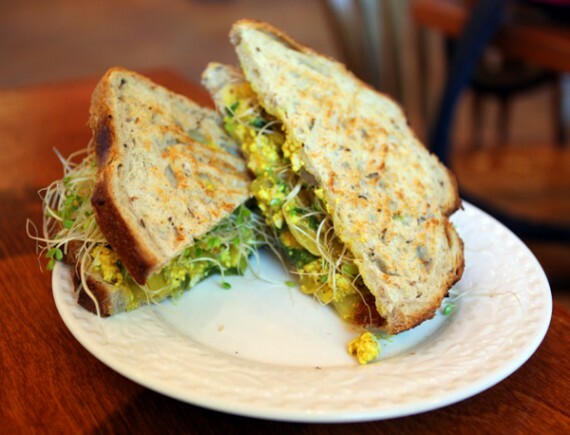 tofu scramble sandwich: turmeric seasoned tofu with onions, mushrooms and spinach, grilled on rye bread, with sprouts. served a la carte. optional soy cheese for additional charge. much to my delight, breakfast is served all day at chaco canyon, so we started off with a tofu scramble sandwich. it came on grilled rye bread and was topped with loads of tumeric tofu, onions, mushrooms, spinach, and sprouts. so freaking good. the tofu was perfectly flavored, and not too mushy. hot little nuggets of soy, just they way they should be. the vegetables were fresh, and the bread was warm and crispy. i’d definitely order this again. 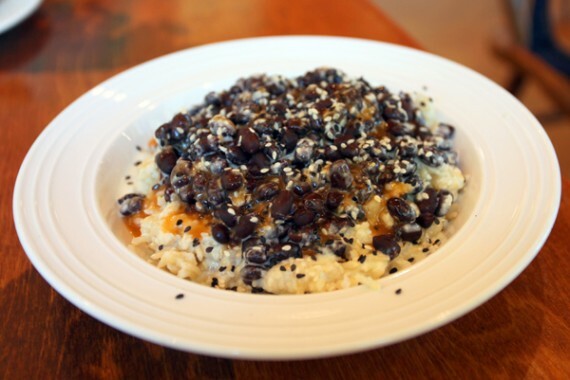 the basic bowl: brown rice or quinoa and black beans with either our peanut sauce or garlic tahini. next we shared what’s probably the most simple item on the menu, the basic bowl. this comes with brown rice or quinoa, black beans, and your choice of sauce. we ordered it with brown rice and tahini, and it was excellent. just so well prepared with soft sticky rice, plump beans, and creamy sauce. love, love, loved it. there were tons of vegan desserts to choose from as well, but we decided to pass on those since we were saving ourselves for mighty-o. 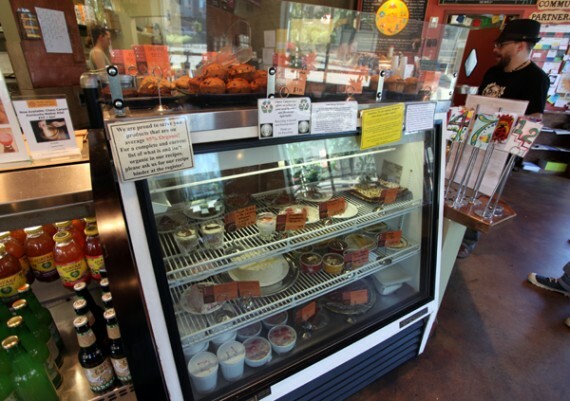 next time i will definitely try out some of the cakes at chaco canyon though, as well as their vegan reuben made with field roast! inside, the cafe is super cute and cozy. you order at the counter, and there’s comfy booth seating where they bring you your food. oh, and they have BEER ON TAP. what’s not to love about chaco canyon?! i know i’ll be back. breakfast at wayward cafe in seattle: it doesn’t get any better than this! wayward has been one of my favorite restaurants since 2005, when i was a relatively new vegan. we are talking about long before i had this blog, before i was married, before i could even legally drink. as i’ve said before, wayward is nothing short of incredible. it’s got an all vegan menu, it’s family/locally owned (i believe now, by the same people who own pizza pi), and the food is RIDICULOUSLY GOOD. it keeps early hours (9am -4pm), and the breakfast is unmatched as far as i’m concerned. 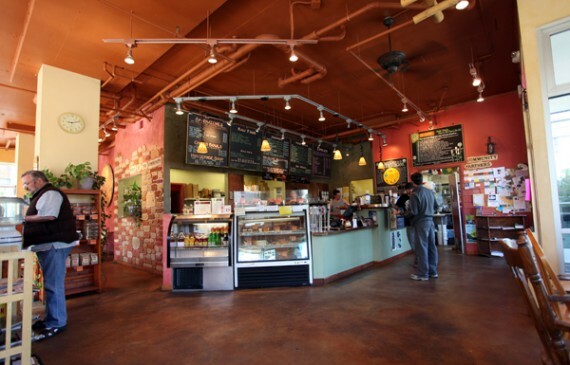 the establishment recently moved from a residential area in greenlake to the vegan center of seattle, university way. 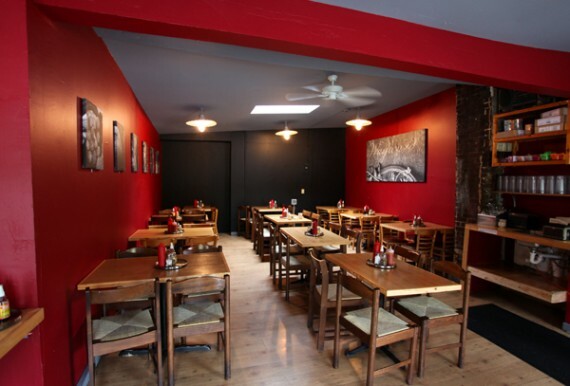 we hit up their newish location last month and left super full and happy, for the most part. okay, so when you have good and bad news, you are supposed to start off with the bad news first, right? well, the bad news is…our “omlet” was full of nasty follow your heart cheese that rendered it almost inedible. 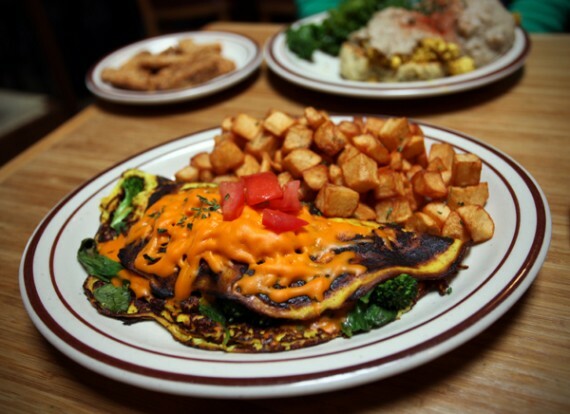 the menu description sounded amazing, tons of vegetables stuffed into a vegan omelette with a side of home fries. both the “omelette” itself, and the filling were delicious….the only issue we had was with the unmelted soy cheddar covering it. 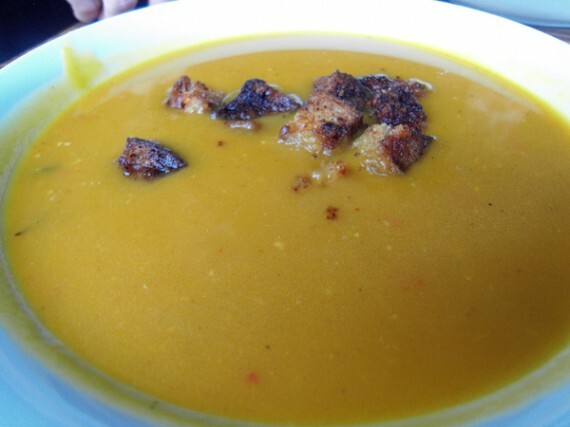 seriously, everything about this dish rocked…but just look at that gross orange gunk. party foul. we were able to pick most of it off, but next time i will order this meal sans vegan cheese. moving on to the good news. 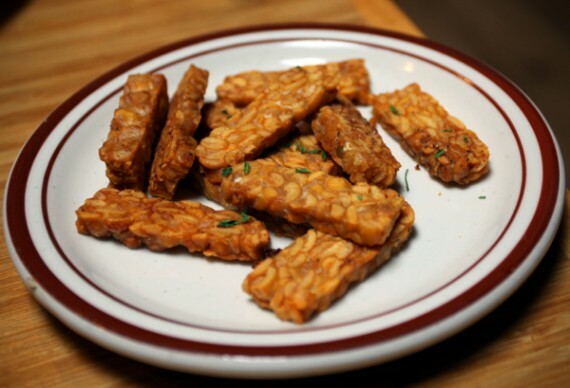 next up, we got a side of tempeh bacon which was phenomenal. 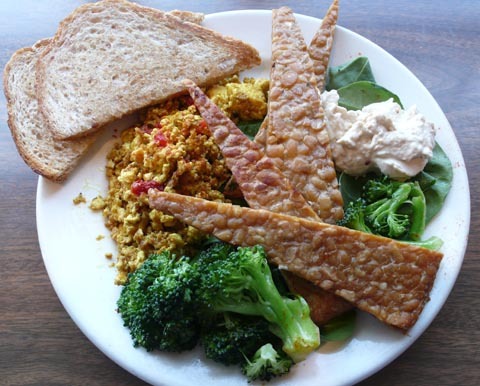 salty, crispy, and perfectly moist in the middle….this is the best vegan bacon i’ve ever had. the picture doesn’t do it justice, but these were little nuggets of pure bliss. we also ordered the country bumpkin, which was way too good for words. 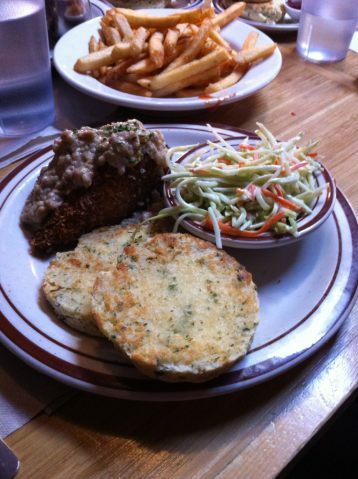 even better than standard biscuits and gravy, this meal consisted of a warm open faced biscuit, topped with tofu scramble, and smothered in country “sausage” gravy. add to that a side of garlic steamed greens, and i’m in heaven. SERIOUSLY, so good. the chunky gravy was incredibly rich, the biscuit was moist, and the tofu was perfectly scrambled. i would eat this every day if i could. when in seattle, breakfast at wayward cafe is a must. although i hated the follow your heart cheese, everything else i’ve tried from the restaurant has been flawless. 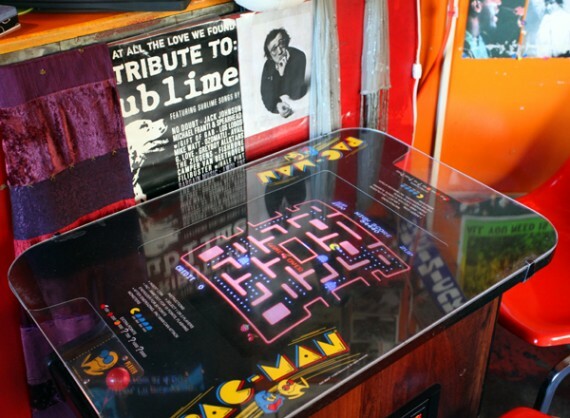 plus, the staff is nice and they play good music. 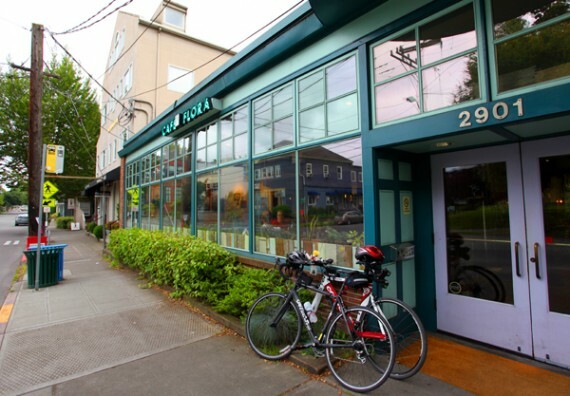 ask any seattle local, and they’ll tell you cafe flora is a “must hit spot” for visiting vegans. while the restaurant is merely vegetarian and admittedly very dairy and eggs heavy, much of the menu can be veganized, and the food is bloody fantastic. 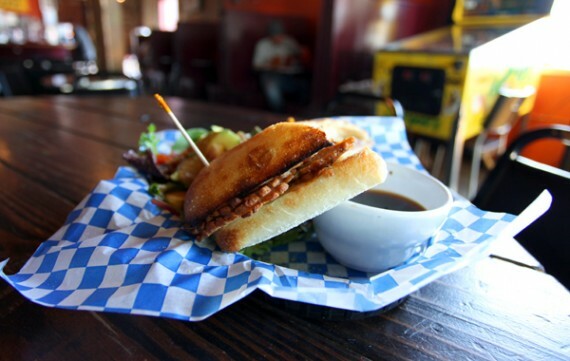 the fancy schmancy establishment has been around since ’91 and specializes in meatless cuisine using local, organic, and sustainable produce. the care they put into the dining experience really shows—not only are the dishes top notch, but the ambiance incredible. 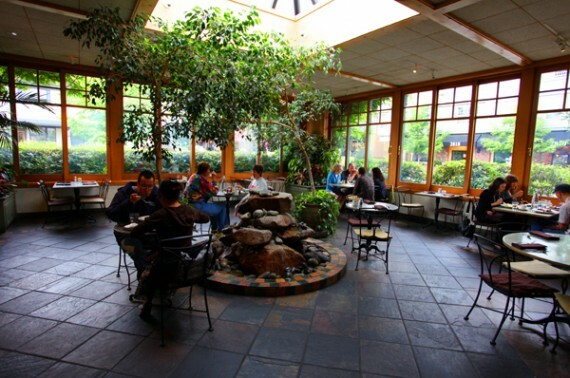 we visited cafe flora for brunch 2 years ago, and were completely floored. our experience last month was no different. even some of my omnivore friends consider cafe flora to be the ultimate brunch spot in seattle, and i think they’re right. the regular menu has some great vegan options including waffles, scrambles, and cinnamon rolls…but on our last trip, we ordered a couple of the seasonal specials. 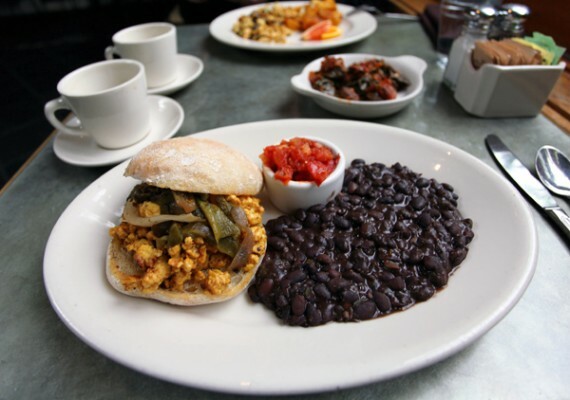 i went with the vegan version of the breakfast torta (pictured above), and was pleased beyond belief. this dish is vegetarian and made with eggs by default—but just ask your server, and the yucky stuff can easily be swapped out for tofu, and the cheese can be omitted. and i can personally testify that the vegan version is THEBOMB.COM. 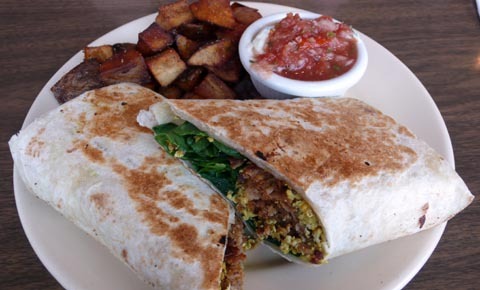 we are talking a rich and delicately greasy tofu scramble heaped onto a soft warm ciabatta roll with grilled peppers. not to mention a massive side of black beans and crazy-good pot of smokey tomato salsa. the “summer mushroom scramble” special was just as astounding. 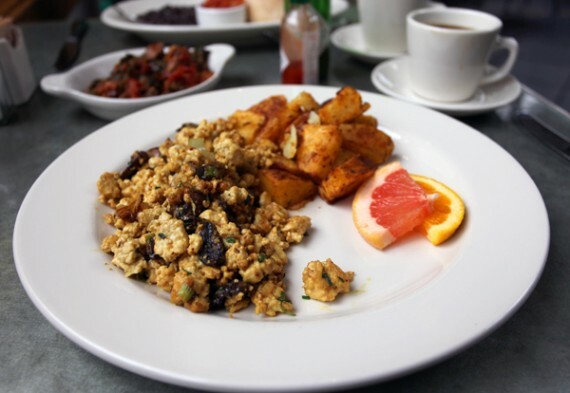 the same magical tofu scramble (immensely flavorful and decadent, yet somehow not too heavy), was mixed with mushrooms, onions, chives, and tarragon. on our last trip, we were wowed by 2 different tofu scrambles at cafe flora, and this one was every bit as delicious. i am gonna go ahead and say that cafe flora has THE BEST tofu scrambles i’ve ever eaten. after 3 home runs, this must be much more than chance. we also ordered a side of spicy collard greens for $3.50, which was excellent. you can see it in the background of the pictures above. basically it was a tiny pot of tasty greens with a wonderfully spicy sauce on top. i’d highly recommend it. inside, cafe flora is just lovely. you feel like you are eating outdoors in the huge dining room, which is decorated with several plants and a trickling fountain. the place fills up pretty fast on weekends, so my advice would be to get there early. we arrived at 9am to open them up, and we weren’t the first ones there. 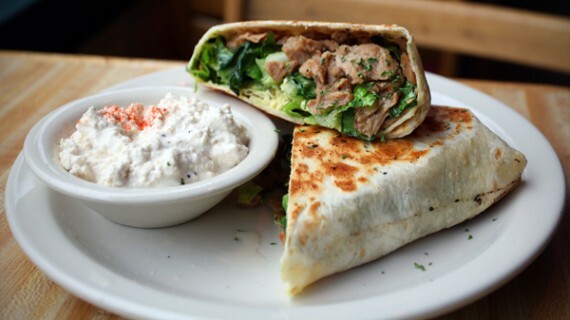 next time you are in seattle, be sure to pay cafe flore a visit. the food is incredible, and the setting is beautiful. i really think you’ll love it. this is so the kind of place i would take my parents, i don’t know why, it just has that vibe. there’s no place quite like cyber dogs. 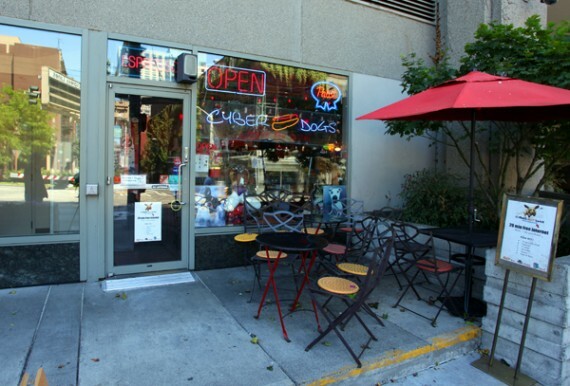 the small and quirky seattle internet cafe has been around since 2002, and sells an entirely vegetarian menu of hot dogs—all of which can be made vegan! 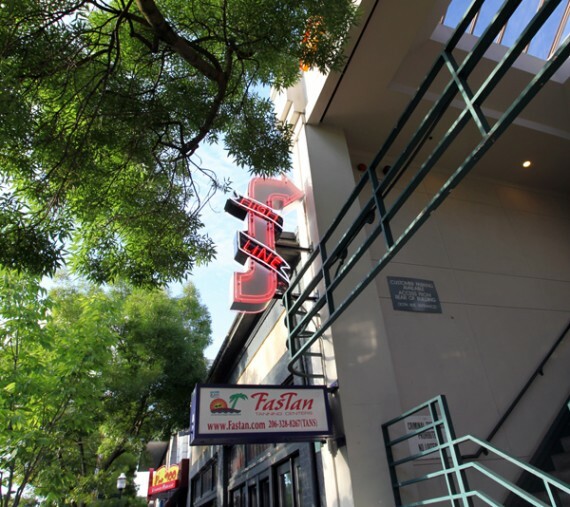 we stopped by recently and were huge fans of the funky atmosphere and delicious food. 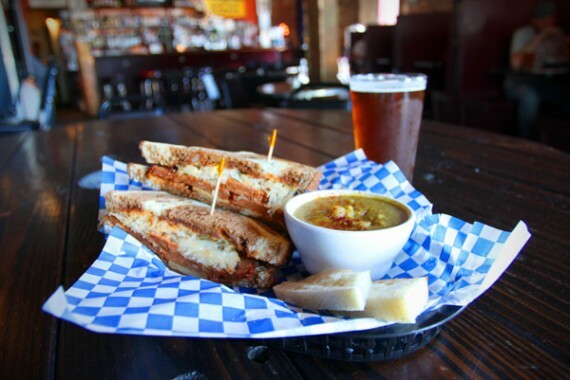 we split the vegan version of the “mama tatianaon” (the original comes with parmasean cheese), which was an italian sausage smothered in sauce, tomatoes, green onions, artichoke hearts, fresh basil, garlic, and vegan cheese. the picture isn’t much to look at, but i can promise you this thing was freaking amazing. 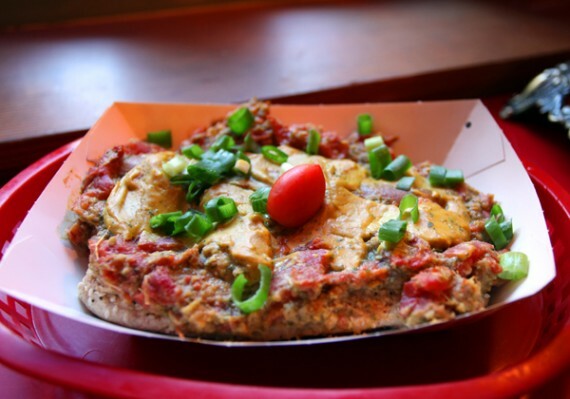 cyber dog’s homemade vegan cheese is incredible, and the whole thing was just oozing with awesome flavor. it was pretty messy, as you can see, so we had to eat it with a knife and fork. good times! 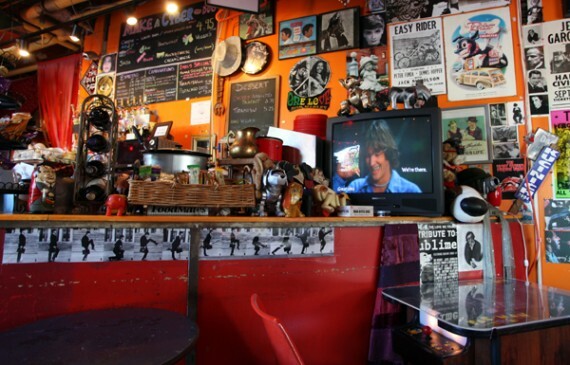 there are movie posters and pictures of celebrities everywhere, and when we were there they were even playing dazed and confused on the television. haha, the perfect 90s movie to watch in an internet cafe. cyber dogs is definitely worth checking out if you are in seattle. i know i’ll be back! (on the corner of 9th and Pike). 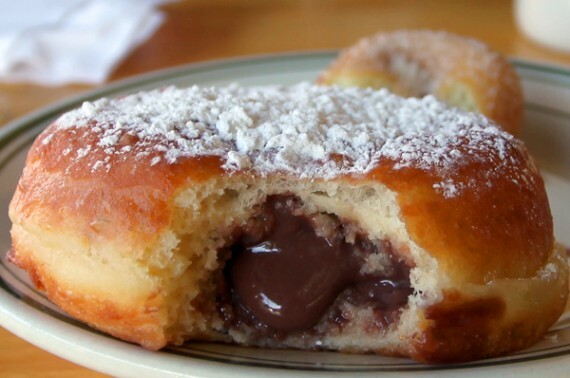 this chocolate creme filled treat is by far the best donut i’ve ever had, and it’s from the 100% vegan mighty-o in seattle. i know i have gone on and on about mighty-o the past, and about ronald’s in vegas and so on…but this donut officially takes the cake (no pun intended). 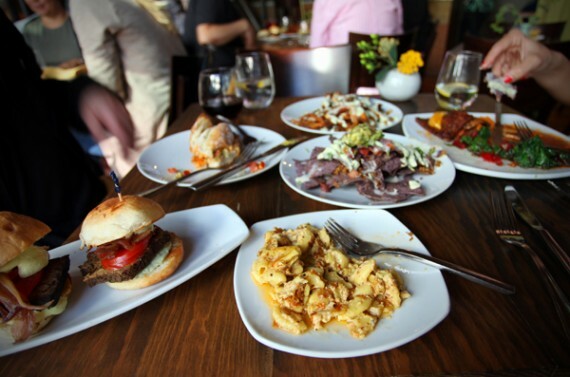 if you are looking for the ultimate meat-free dining experience in seattle, plum bistro is definitely your place. 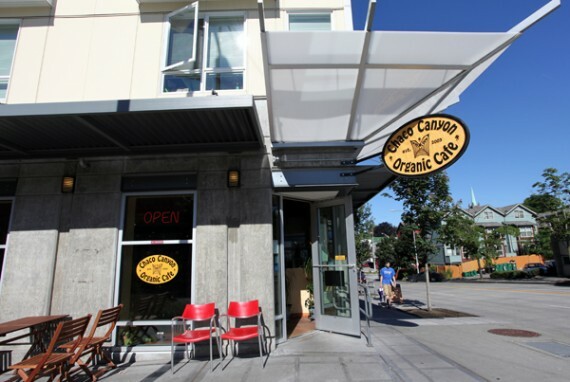 the gourmet restaurant is located on capitol hill and serves amazing all vegan cuisine for breakfast, brunch, lunch and dinner. the food can be a bit pricey (think $14-$18 for an entree), but it’s fantastic and well worth it. one little secret that you can’t find on plum’s website though, is that they have a HAPPY HOUR sundays from 4-10pm and monday thru friday from 3-6pm, where food and drinks are super cheap. we hit up plum for the happy hour deals a couple weeks ago with a friend, and ate enough food to feed a small country for under 60 bucks. it was an excellent time. we started with a plate of the “mac n yease” which was down from $7 to five bucks for the happy hour special. i have been wanting to try this ever since this.charming.man raved about it back in january, and i must say it did not disappoint! 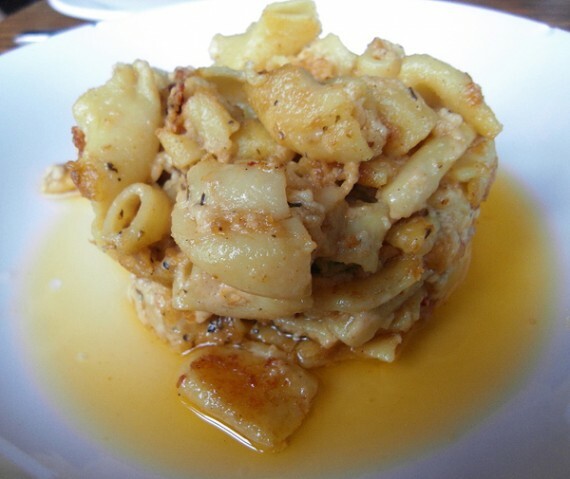 it was spicy, creamy, flavorful, and honestly the best vegan mac and cheese i’ve ever eaten. there were mushy globs of cheese in between the noodles, just like the real thing, and little burned bits around the edges. 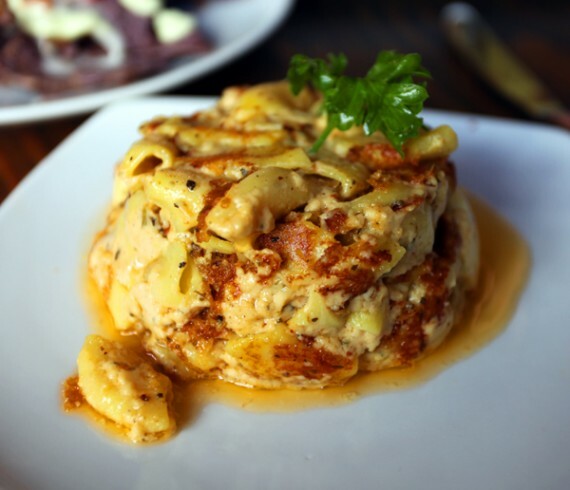 i’d say plum is worth visiting for the mac n yease alone—it blows all other mac and cheeses out of the water. one catch about the happy hour menu is, you can’t order from it without buying a drink…but don’t worry, they have non-alcoholic stuff for all you xpeoplex. i went with the white russian because it’s my favorite mixed drink, and it’s impossible to find a vegan version at bars here in los angeles. the only other place i’ve had a vegan white russian outside of my house was at tube in portland, and plum’s was a million times better. 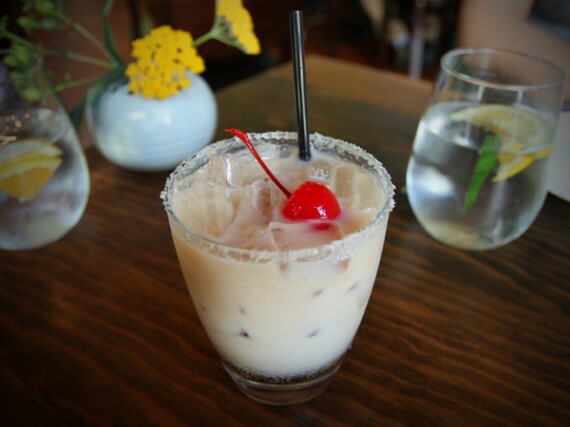 the sweet tea vodka/soy milk mixture came in a sugar-rimmed glass, complete with a cherry on top. i absolutely loved it. 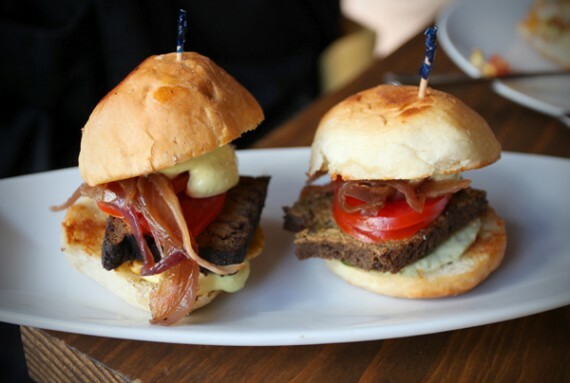 we got a couple of mini burgers from the happy hour menu, because come on, who can resist vegan sliders?! 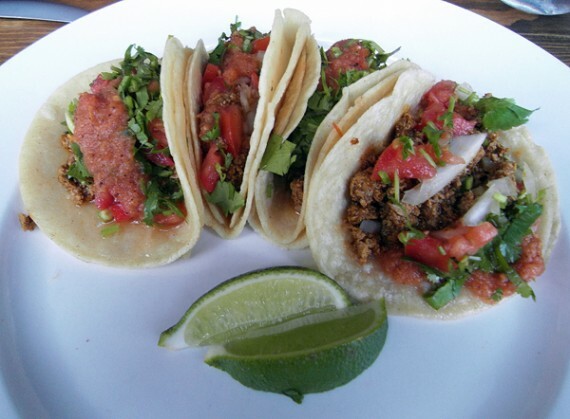 plum has several to choose from including the crazy jamaican, tofu bbq seitan, quinoa, and el basito caliente. i am pretty sure the ones we ordered were the crazy jamaican and el basito caliente, and they were delicious. they were pretty big as well, you could fill up on a few of these and have dinner for 6 bucks. we also got a plate of quinoa nachos, which were a great deal for $4. 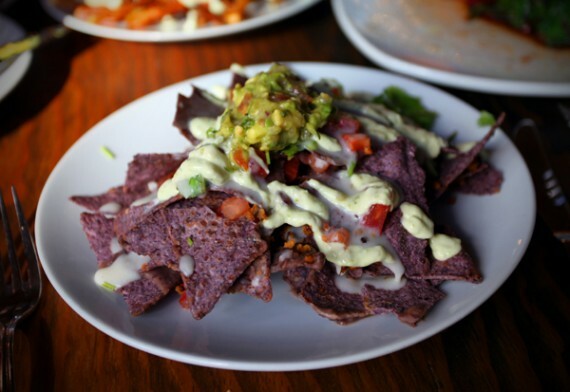 this dish of blue chips came topped with an amazing creamy sauce, pico de gallo, guacamole and melted cheese. i am pretty sure the cheese on the nachos was follow your heart, which i am not a big fan of, but they were still pretty good. next up was an order of gourmet garlic fries with jalapeno sauce, and they were super tasty. 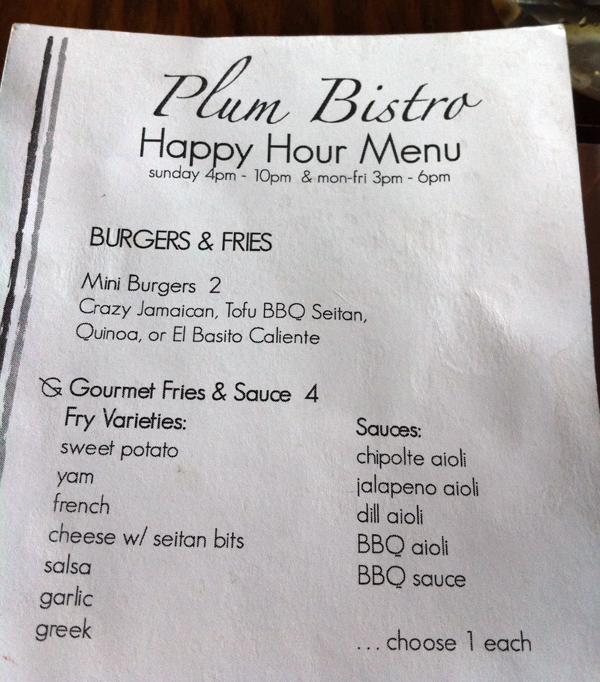 plum has a huge list of fries and sauces to choose from, and we originally ordered the “cheese w/ seitan bits” option. unfortunately/fortunately, they messed up our order and brought us the garlic fries, which wound up being great. 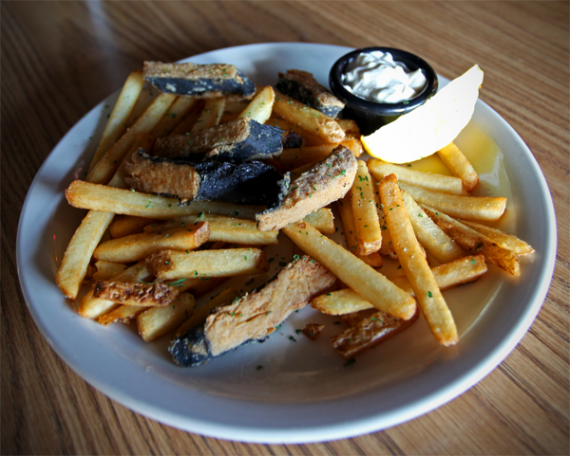 the jalapeno sauce was to die for—rich gooey, and spicy—it went perfectly with the thick crispy fries. we also got a “vegan hot dog,” which to our surprise wound up being a high-quality field roast sausage! man i love field roast, so this was a nice treat. it came smothered in crazy good sauces and topped with sauerkraut. amazing! we had our fill of cheap junk food snacks, but our friend wanted to be a little bit highbrow, and order something from the dinner menu as well. 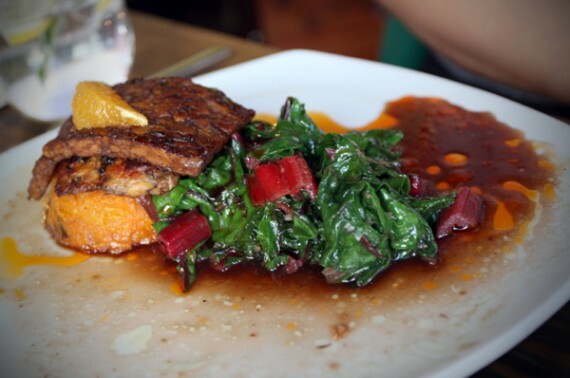 she got the orange-balsamic glazed tempeh with thai-spiced mashed yams and bitter greens. she let me try it and, WOWZA….it was awesome! the yams especially were not to be believed, such amazing flavor. i have a feeling that this is the kind of gourmet fine-dining food most people visit plum for, and plum knows how to do it well. this was by far one of our best meals in seattle, and one of the best i’ve had in a long time. 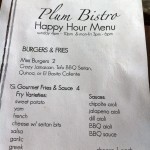 plum really has everything going for it: they are an all vegan restaurant with excellent food, they serve mixed drinks as well as beer and wine, and they have a nice fancyish yet comfy atmosphere where you can relax and hang for awhile. if you are in seattle, i would put this at the top of your “must visit” list, because plum is simply amazing. i can’t wait to return and try out their brunch! 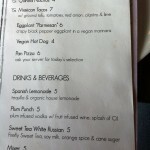 highline: an all vegan bar in seattle! one my favorite places i’ve ever been would have to be highline in seattle. 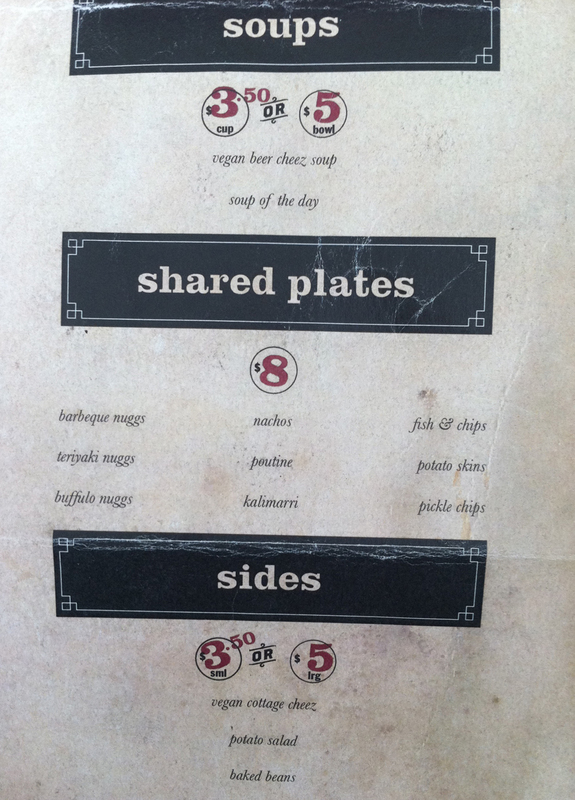 first up from the shared plates menu, we ordered the fish and chips. the minute we saw this greasy classic was offered, we knew we had to order it—and highline did not disappoint! the “fish” was some kind of soy concoction (tofu perhaps?) lightly battered and wrapped in nori. it was beyond delicious. 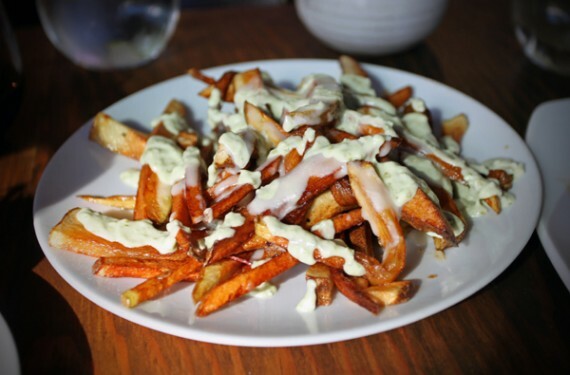 the fries were perfectly cooked as well, and the dish came with the most unbelievably creamy pot of tartar sauce. by far, this is the best plate of vegan fish and chips i’ve ever had. we also shared the caeser salad with added vegan chicken, and it was excellent as well. cool and fresh romaine, all topped off with crispy little nuggets of grilled soy. 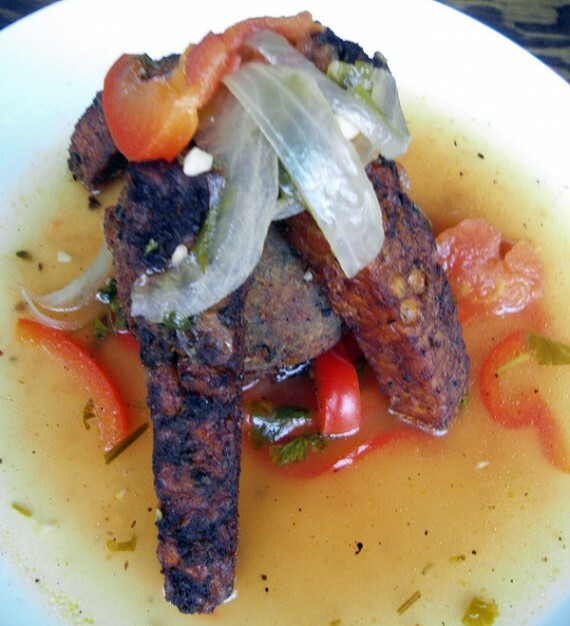 again, this dish exceeded our expectations. 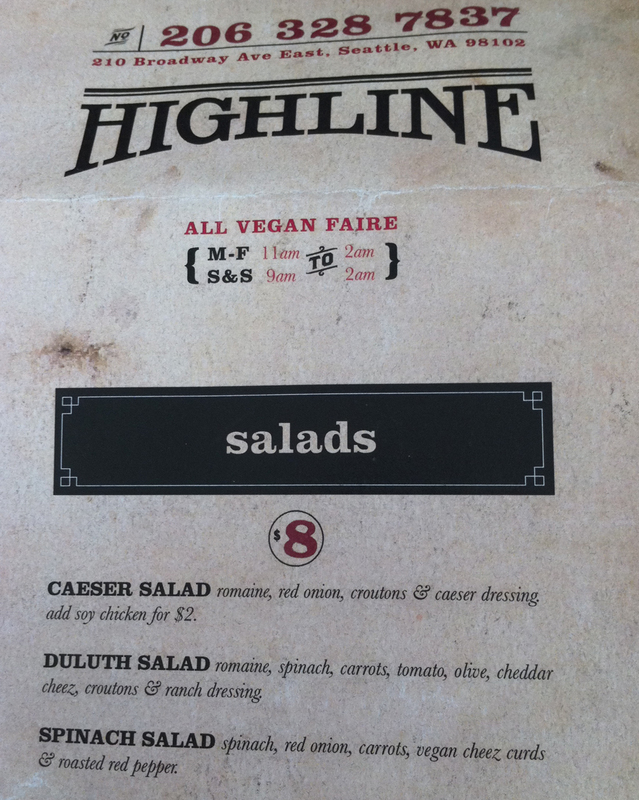 lastly, on the first night, we shared highline’s version of the vegan reuben. 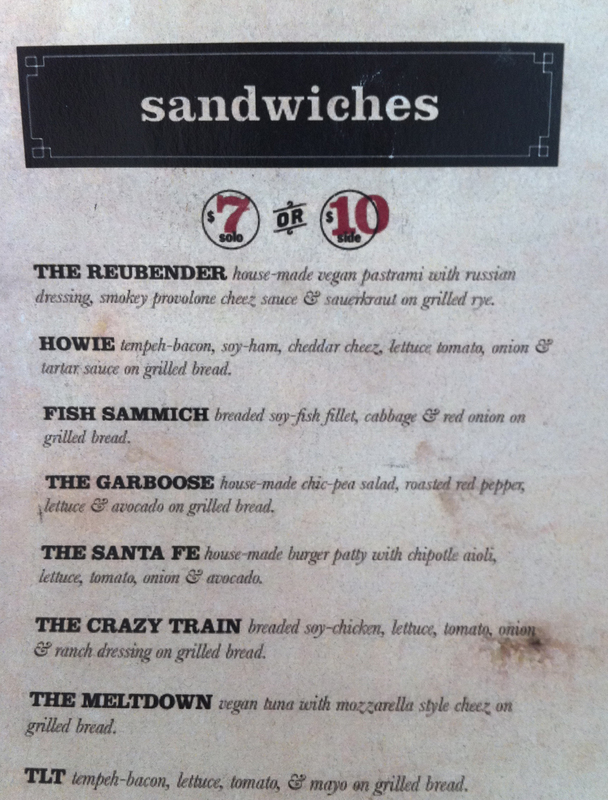 all the sandwiches are either $7 solo or $10 with a side. there was a really interesting vegan cottage cheez dish on the menu, so we ordered it as a side. 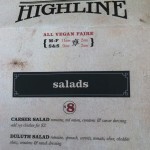 unfortunately, highline was out of that and we wound up with a side of coleslaw. it was a happy ending though, because the coleslaw was wonderful. rich and creamy with a tasty blend of shredded vegetables. but enough about the side, let me tell you about THE SANDWICH! 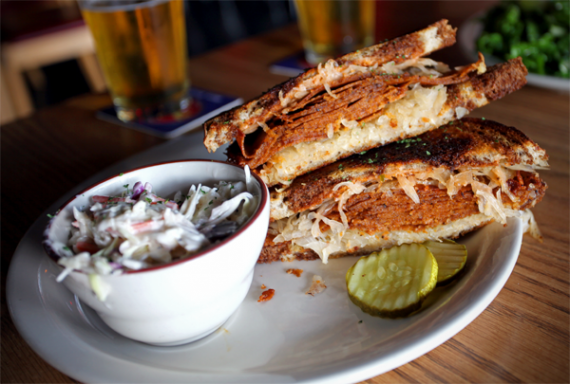 OMG holy wow, this was an epic sandwich—the best reuben i’ve ever eaten. if this thing were down in LA, it would steal the reuben wars crown in 2 seconds flat. it was filled with the meatest homemade vegan pastrami that was thickly sliced and super hearty. not to mention phenomenal cheese and rich dressing. i couldn’t even finish half of it; it was so massive. 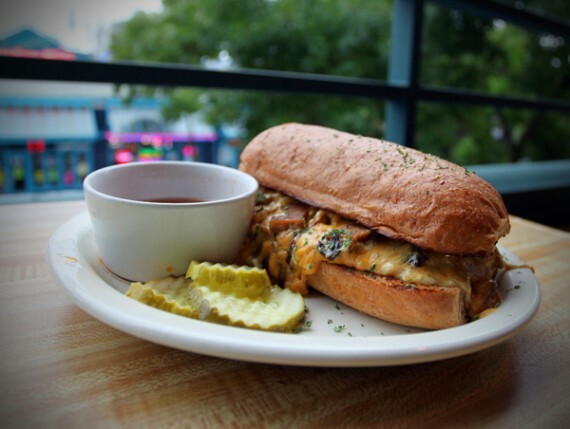 honestly, i just can’t say enough good things about this sandwich. on our second night at highline, we started with the potato skins appetizer. this came with six mini potatoes loaded up with cheezy sauce, tempeh bacon, tomatoes, and onions—all with a thick creamy sauce. to say this dish was amazing would be an understatement! 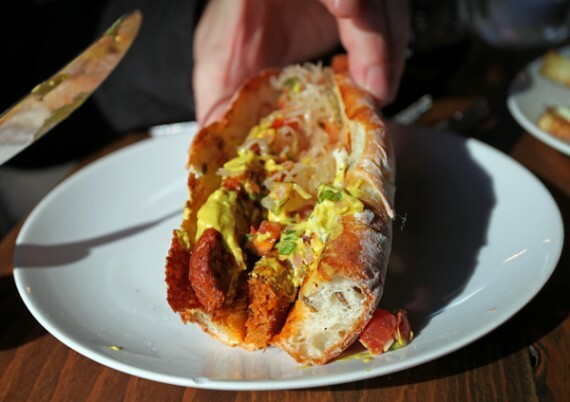 it was crazy good, fantastic, just like so many other dishes we tried at highline. 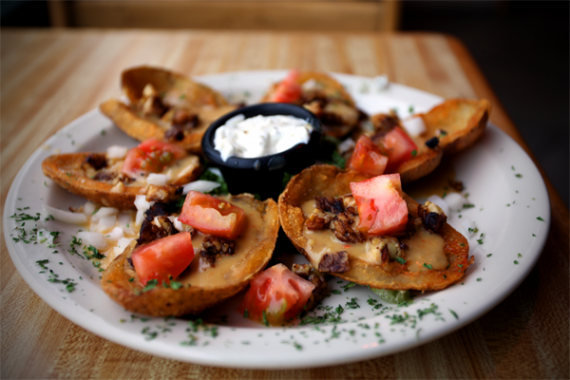 i told the bartender/waiter that these were the best potato skins i’d ever eaten, and he was like, “yeah, we haven’t been open very long so we are still working out the recipes. they should get even better.” i am officially jealous of everyone who lives in seattle. 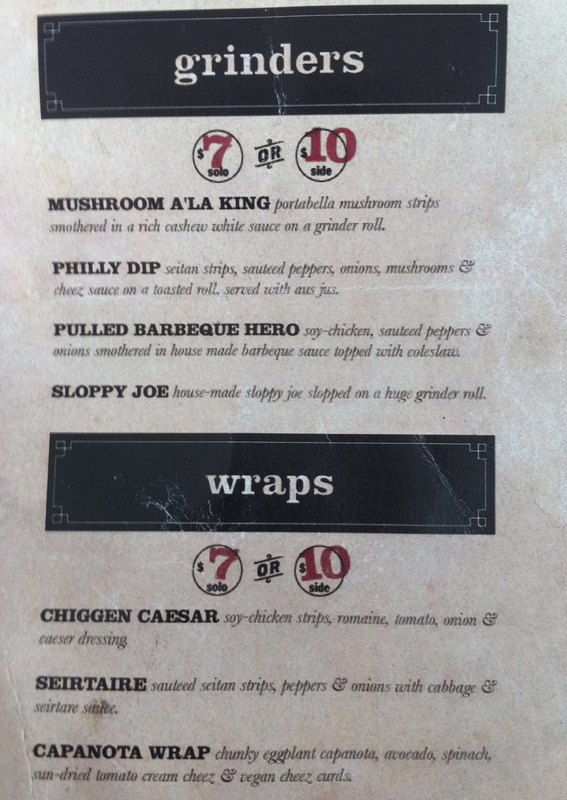 next we split the “chiggen caesar wrap,” and much to my excitement, the cottage cheez was back in stock! the side was sooooo good. i never thought i would eat a vegan version of cottage cheese, and i loved it! they made it out of chunky crumbled tofu and some kind of thick white sauce. the texture was so close to the real thing, i couldn’t believe it. 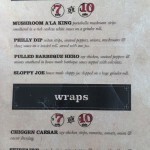 the wrap was even better than the caesar salad we’d eaten the night before. it came in an over-sized flour tortilla complete with grill marks (which i love). we also shared a vegan philly dip grinder, but asked them to leave out the bell peppers (which i hate). another absolutely perfect sandwich, this thing was filled with grilled seitan strips, sauteed vegetables and tons of melty daiya cheese. the aus jus was flavorful and salty, the perfect dip for this beauty. SO DAMN GOOD. and a feast for just 7 bucks! we were only in seattle for 3 nights, and i tried to convince my husband to return to highline on our last evening as well, but he said 2 times in one trip were enough. dammit. i am already plotting another visit to the pacific northwest. i’ve got to admit, the atmosphere in highline is a little meh…but they haven’t been open very long, so hopefully they will fix it up a bit. it just seems sort of thrown together: they have a huge bar with tables and chairs scattered around, and tons of empty space. the beer selection isn’t great (think pbr), and there is a small amount of outdoor seating. the food is FANTASTIC though, and that’s what counts. next time you are in seattle, go to capitol hill and climb the steps on broadway avenue up to highline. 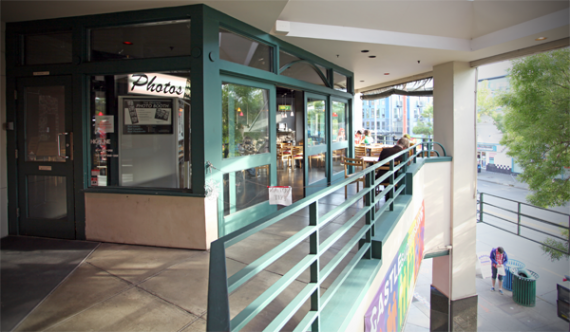 it doesn’t look like much from the outside, but there you will find food unlike anything you’ve ever eaten. i know i will visit as often as possible. 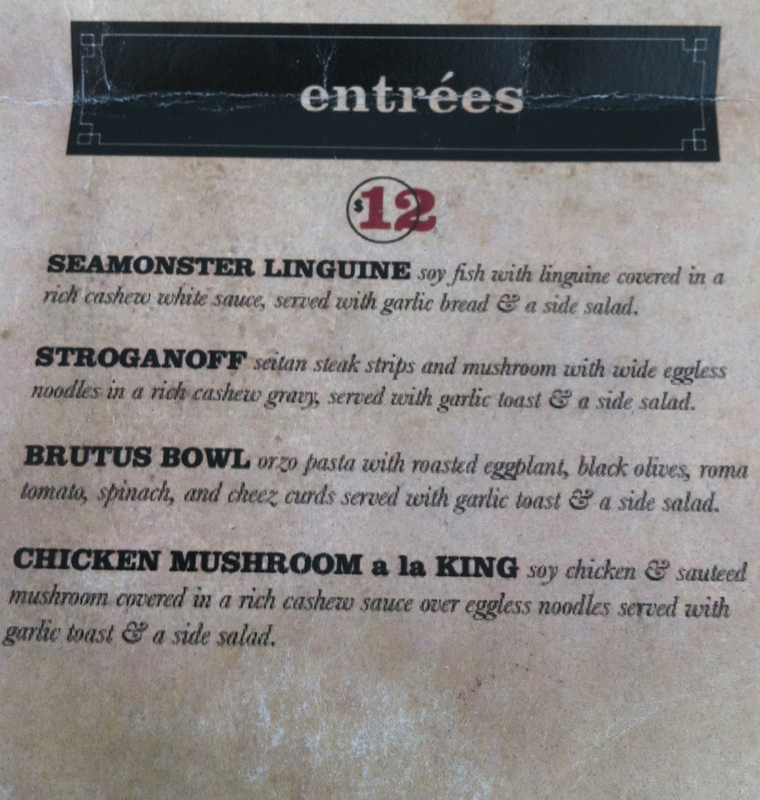 PS: HERE ARE THE MENUS!!!!!!!!!! read at your own risk, they will make you way hungry. 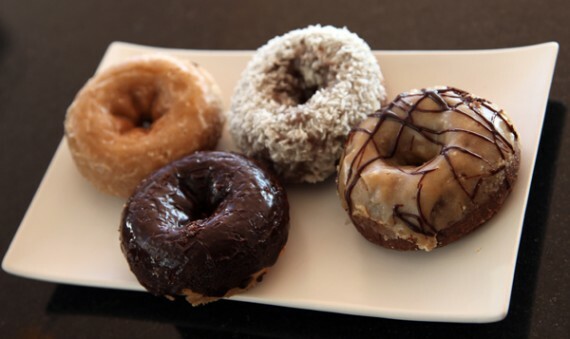 over here in the western part of the united states, we have our share of amazing vegan donuts. 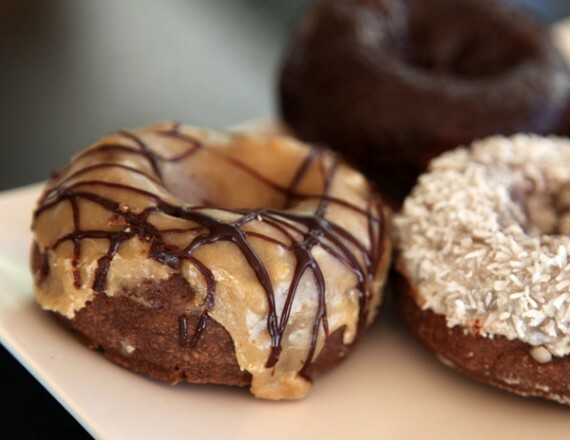 we have the gourmet delicacies from madeleine bistro in LA, the cheap old school treats that would fool omnivores from ronald’s in vegas, and then the rich well-crafted, organic donuts from mighty o in seattle. while i love all these places for different reasons…mighty o wins for inventive flavors, taste variety, and all around excitement. recently my twitter friend (and quarrygirl.com caption contest winner) @deteriorate offered to bring me some mighty o donuts back from seattle, and the haul was epic. i got hooked up with a combo of french toast, chocolate, don king (chocolate topped with coconut), and peanut butter chocolate. serious sugar coma. the pb chocolate was by far the best, and probably one of the best desserts i’ve had in my life. 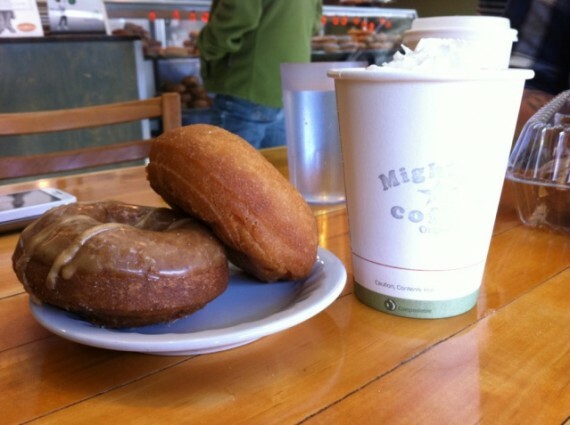 when in seattle, be sure to hit up mighty o. and it may be worth taking a trip up there just to eat donuts! as you know, this blog is mainly based in LA, except for when we travel…or when we get field reports from agents in other cities. lucky for y’all, tonight’s field report comes from our pacific northwest operative, who gives us a very brief yet drool-worthy review of seattle’s newish vegan and organic restaurant plum bistro. 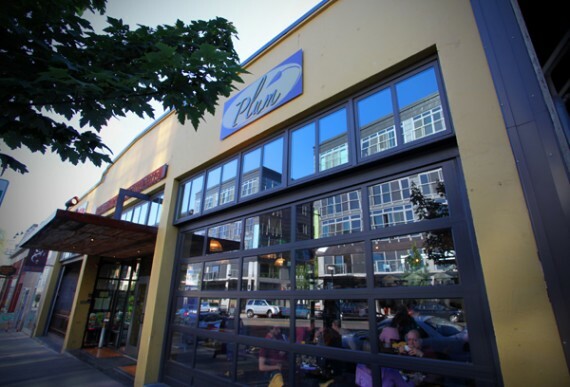 plum apparently offers an AMAZING menu and is located conveniently on capitol hill, so you really have no excuse not to visit. let’s take a look at the food and read the one line reports of each item. from what i hear, everything was PERFECT…even better than it looks. 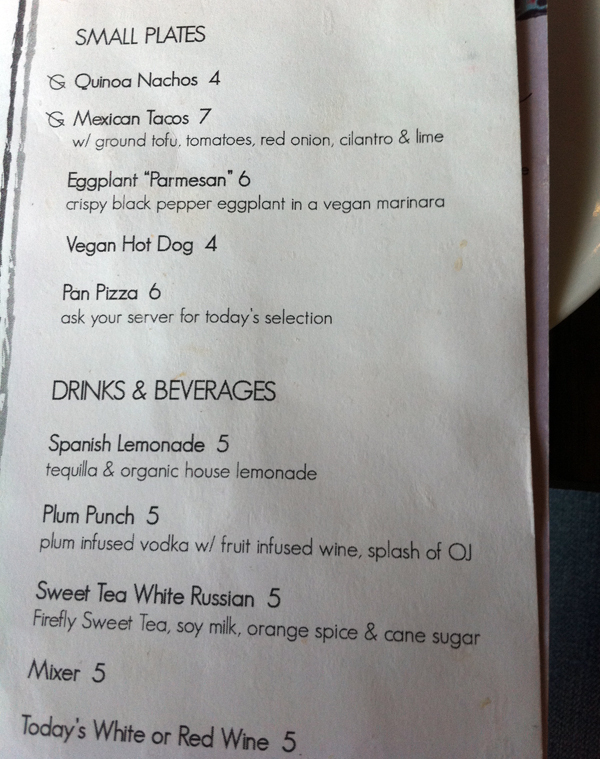 so be sure to hit up plum vegan bistro in seattle when you have a chance. 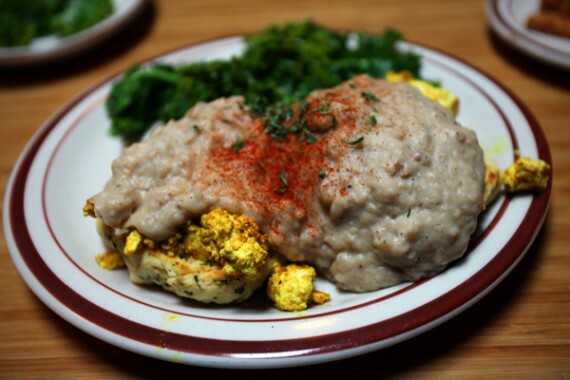 “all in all this was the best experience of seattle vegan food i have had on any of my visits…this was something different and so mind blowing to me, i was floored. 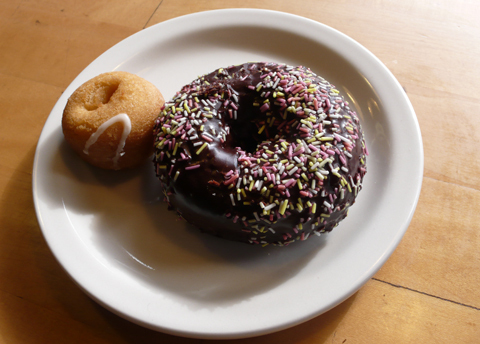 i can’t even tell you how elated i was to find mighty-o, a donut-baking shop in seattle that was ENTIRELY vegan. i was even more elated when i tried their donuts and they tasted EXACTLY like (if not better than) the real (unhealthy, ridiculously sinful, fattening, artery-clogging) thing! 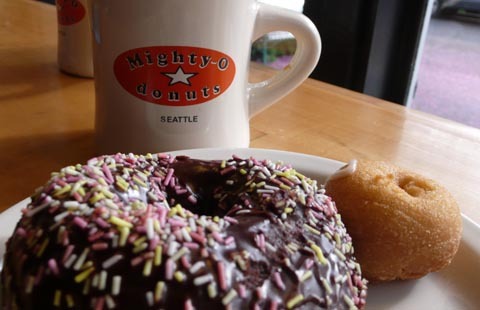 i’ve gotta say, during the short time i spent in seattle, mighty-o was by far my favorite discovery. it’s definitely a heaven on earth for any vegan with an intense sweet tooth who misses the sinful vegetarian lifestyle. i’ve not had a donut in YEARS, but i remember loving them. i’ve alway had a penchant for sugar-laden treats. when i was a vegetarian teenager, i used to drive all the way from santa clarita to a donut shop in van nuys (a 20 mile journey) to obtain their coveted, brand-new, freshly-cooked donuts (if i arrived during certain hours, i could even watch them being made on a giant conveyer belt—what fun)! unfortunately, at the age of 20 when i became a vegan, i assumed that avenue of donut-devouring pleasure had been permanently closed off to me. ….boy, was i wrong! not only did mighty-o give me the opportunity to enjoy a pipin’ hot sugary donut, it also made those old treats i used to eat look like limp, crappy, fast-food versions of the real thing. and with a refillable cup of mighty-o’s coffee, plus a great seat in the window, i could easily spend all morning sipping drip and eating donuts. it’s no surprise that with vegan sweets this good, there was a line going out the door of mighty-o at 11 am on a saturday morning. the line was so long, in fact, that i turned around and decided to come back the next day, early. when i returned on sunday at around 8 am, the place was still pretty full—i guess people are willing to wake up early and wait for these magical donuts, and i am too! 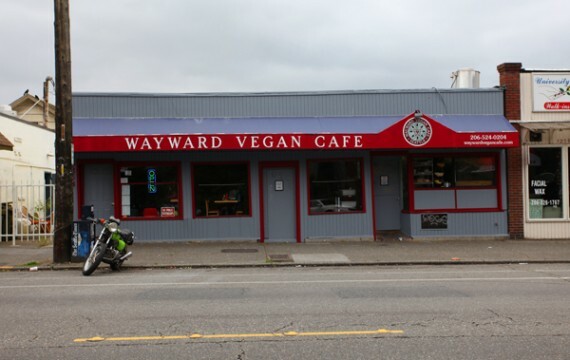 wayward cafe is a modest cash-only co-op—a small house that’s been converted into an entirely vegan restaurant, located in a residential area of seattle’s university district. more importantly, it’s where i had the best breakfast of my entire life. while there are a few things that kind of irritate me about this restaurant, the food is so wonderful it makes them all irrelevant. if i lived in seattle, i would eat at this place several days per week. 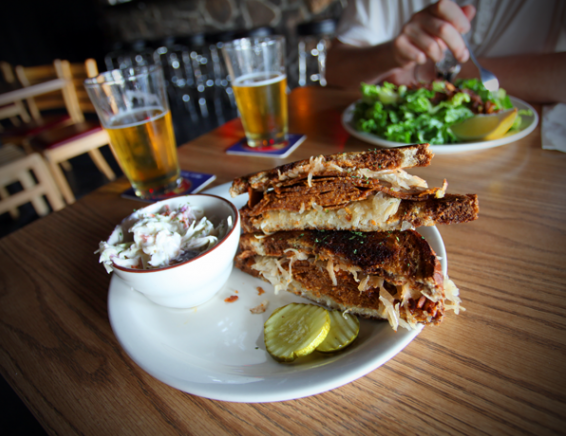 i’m talking food so good, it rivals pure luck…if wayward cafe had tap beer, i’d surely move to washington. 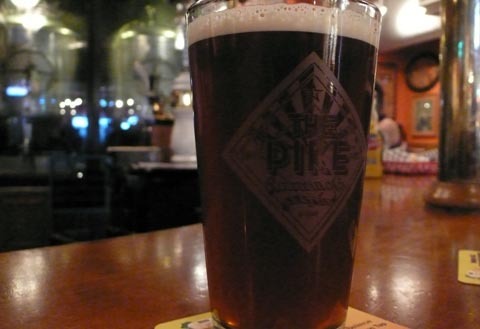 pike brewing company: come and get it! Having said all that, I forget my veganism when I show up at The Pike, because the thing that gets me every time is the cask ale, served at just the right temperature from traditional British-made hand pumps. If the stars are aligned, you can get a porter, stout or (if you’re really lucky) the perfectly hopped IPA, which I was lucky enough to find on cask suring my last visit. 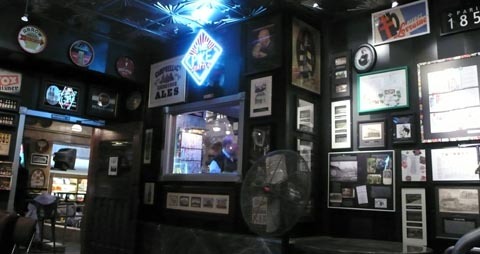 The vibe is similar to a large English pub, but with a very Pacific Northwest feel: comfortable pleather couches, large plastic covered menus and the stench of fried food everywhere. 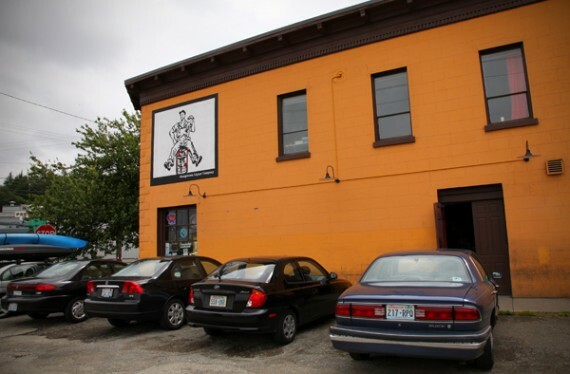 The Pike is one of Seattle’s best breweries, arguably the best location, probably the best vegan food offerings and, albeit at certain times, the best atmosphere. 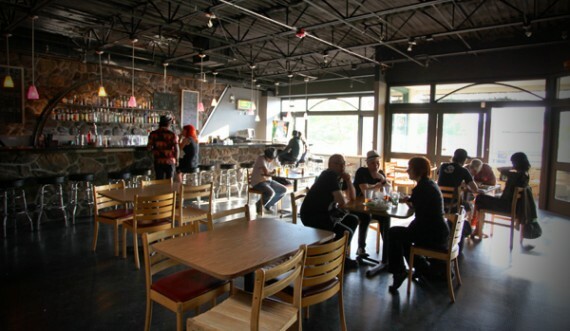 If you enjoy good vegan food and great beer in a hassle-free environment the Pike is certainly for you. Check it out on your next trip Up North.